Here is a charming tale of a toy soldier that turns into a prince. 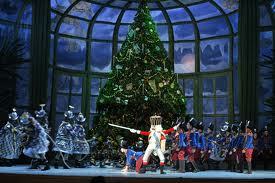 I know that you will like this ageless story of The Nutcracker. On the twenty-fourth of December, Dr. Stahlbaum's children were not allowed to set foot in the family parlor. Fritz and Marie sat together in the back room and waited. In whispers Fritz told his younger sister that he had seen Godfather Drosselmeier. At that, Marie clapped her little hands for joy and cried out, "Oh, what do you think Godfather Drosselmeier has made for us?" Fritz said it was a fortress, with all kinds of soldiers marching up and down. "No, no," Marie interrupted. "Mr. Drosselmeier said something to me about a beautiful garden with a big lake in it and lovely swans swimming all around on it." "Mr. Drosselmeier can't make a whole garden," said Fritz rather rudely. Then the children tried to guess what their parents would give them. Marie sat deep in thought, while Fritz muttered, "I'd like a chestnut horse and some soldiers." At that moment, a bell rang, the doors flew open, and a flood of light streamed in from the big parlor. "Come in, dear children," said Papa and Mama. The children stood silently with shining eyes. Then Marie cried out, "Oh, how lovely!" And Fritz took two rather spectacular jumps into the air. Marie discovered a silk dress hanging on the tree. "What a lovely dress!" she cried. Meanwhile, Fritz galloped around the table, trying out the new horse he had found. Then he reviewed his new squadron of soldiers, who were admirably outfitted in red and gold uniforms. Just then, the bell rang again. Knowing that Godfather Drosselmeier would be unveiling his present, the children ran to the table that had been set up beside the wall. The screen that had hidden it was taken away. The children saw a magnificent castle with dozens of sparkling windows and golden towers. Chimes played as tiny ladies and gentlemen strolled around the rooms, and children in little skirts danced to the music of the chimes. Fritz looked at the beautiful castle, then said, "Godfather Drosselmeier, let me go inside your castle." "Then make the children come out," cried Fritz. "No," said their godfather crossly, "that, too, is impossible. This is how the mechanism works, and it cannot be changed." "Then I don't really care for it," said Fritz. "My soldiers march as I command, and they're not shut up in a house." Fritz marched away to play with his soldiers. Marie did not leave the Christmas table, for she was well-behaved. The real reason why Marie did not want to leave the Christmas table was that she had just caught sight of something. When Fritz marched away, an excellent little man came into view. The distinction of his dress showed him to be a man of taste and breeding. Oddly enough, though, he wore a skimpy cloak that was made of wood. His light green eyes were full of kindness, and his white-cotton beard was most becoming. "Oh, Father dear," Marie cried out, "who does the dear little man belong to?" "Dear child," said Dr. Stahlbaum, "our friend here will serve you all well. He will crack hard nuts for all of you with his teeth." Carefully picking him up from the table, Dr. Stahlbaum lifted his wooden cloak, and the little man opened his mouth wide, revealing two rows of sharp white teeth. At her father's bidding, Marie put in a nut, and -- crack -- the little man bit it in two, the shell fell down, and Marie found the sweet kernel in her hand. Fritz ran over to his sister. He chose the biggest nut, and all of a sudden -- crack, crack -- three little teeth fell out of the Nutcracker's mouth. "Oh, my poor little Nutcracker!" Marie cried, taking him out of Fritz's hands. "He's just a stupid fool," said Fritz. 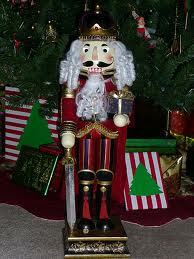 "He calls himself a nutcracker, and his teeth are no good. Give him to me, Marie." Marie was in tears. "No, no!" she cried. "He's my dear Nutcracker and you can't have him." Sobbing, Marie wrapped the Nutcracker in her little handkerchief. She bandaged his wounded mouth. Then she rocked him in her arms like a baby. It was getting late, and Mother urged her children to turn in for the night. But Marie pleaded, "Just a little while longer, Mother dear." Marie's mother put out all of the candles, leaving on only one lamp. "Go to bed soon," she said, "or you won't be able to get up tomorrow." As soon as Marie was alone, she set the Nutcracker carefully on the table, unwrapped the handkerchief ever so slowly, and examined his wounds. "Dear Nutcracker," she said softly, "don't be angry at my brother, Fritz. He meant no harm. I'm going to take care of you until you're well and happy again." Marie picked up the Nutcracker and placed him next to the other toys in a glass cabinet in the parlor. She shut the door and was going to her bedroom, when she heard whispering and shuffling. The clock whirred twelve times. Then she heard giggling and squeaking all around her, followed by the sound of a thousand little feet scampering behind the walls. Soon Marie saw mice all over the room, and in the end they formed ranks, just as Fritz's soldiers did.